Staff from BHP will make science, technology, engineering and mathematics (STEM) come to life for Emerald and Blackwater students when they visit Emerald State High School this week (tomorrow 9 August). 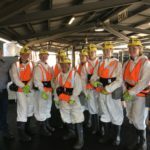 They will also share their career stories with students to inspire them to continue studying STEM fields as part of the Queensland Minerals and Energy Academy’s (QMEA) STEM4 School Kids program. Students will experience hands-on science, undertake experiments in copper extraction and learn process engineering techniques and mine resource management. It coincides with the Year 10 students considering their subjects for senior study and future career pathways, in the lead up to National Science Week (11-19 August). 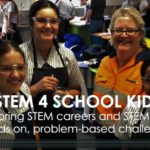 “It’s very important that students join the dots between their lessons and the practical application of STEM subjects and our staff thoroughly enjoy making this happen,” said BHP’s Peter Dowling. “We love the fact that these valuable QMEA events also open students’ eyes to careers they might not have been aware of and pave the way for our future talented and skilled employees,” he said. Aneel Dewan Head of Science at Emerald State High School welcomed the hands-on and engaging nature of the workshop. “To see science in action really helps students understand the practical application of their studies,” he said. The QMEA is a partnership between the Queensland Resources Council (QRC) and the Queensland Government under its Gateway to Industry Schools program. It has 46 schools throughout Queensland.